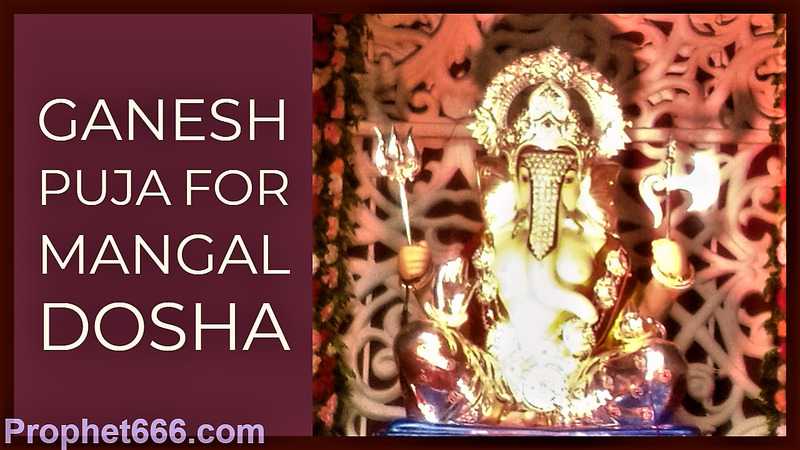 In this post, is given a most simple and easy to practice remedy or Totka dedicated to Shri Ganesha to get relief from Mangal Dosha in the Kundali. This specific Dosha in the horoscope is said to directly affect the marriage or marriage prospects of an individual and create problems in partnerships of any kind, including those related to love and business. This Totka as mentioned above is most simple to practice and any person who is adversely affected by Manglik Dosha can easily practice it without any kind of difficulty to negate the ill-effects of this astrological positioning of Mars in the horoscope by following the two simple steps described below. 1] This Totka has to be performed for 3 Tuesdays in a row. If a woman is performing the Totka, she should perform it on the first Tuesday after her monthly cycle so that it does not get interrupted once again due to the monthly cycle. 2] The practitioner has to take One and a Quarter kilogram of Jaggery or Gud to a Ganpati Mandir and offer it to the devotees present in the temple, immediately after the Aarti. The Gud should be broken into small pieces so that it can easily be give to the people present for the Aarti as Prasad. Normally, the Aarti is chanted in the evening at 7 PM in most Ganpati Mandirs. The practitioner should distribute all the Gud and only keep a small quantity for himself and his family as Prasad. The chanting of the Gayatri Mantra of Shri Ganesha is also very beneficial in removing Mangal Dosha. Shri Ganesha is also the God for Rahu or North Node or Dragons Head, any person who is affected by Rahu Dosha can also worship Ganesha to get relief from this specific Dosha. Rahu Dosha can affect an individual or family for several generations as it is related to the ancestors of the individual. Note- Being a Manglik is not always bad, it makes an individual dashing, fearless and dynamic. A marriage or partnership between two Mangliks can negate the ill-effects of this Dosha. Some other Remedies for Mangal and Rahu Dosha, including Mantra Remedies and Tone and Totke from the Lal Kitab can be seen on this site by doing a site search. Even though, there are many lengthy and complicated remedies for this and most other problems related to the paranormal and astrology, we always try to keep these remedies as simple and easy as possible by removing the unnecessary procedures and rituals. Can this manra also be used for removing Angarak dosh from Kundali?Or is there a bettter mantra for the same purpose? Any astrological problem can be resolved by this remedy, provided it is performed with full faith. Neel/Ashok Sir please guide me little. For chanting beej mantra only like aim, shreem, hreem, kleem etc do we have to check different chakras like rashi and nakshatra chakra, kulaakul chakra etc? Are there any viniyog of single sheed mantras? गणेश विसर्जन के दिन २३ सितम्बर को भाद्रपद माह की शुक्ल पक्ष की चतुर्थी का दिन है .इस दिन अनंत चतुर्दशी का व्रत किया जाता है ,इस दिन भगवान् विष्णु की पूजा की जाती है .जब पांडव राज्य गवां कर वन वन भटक रहे थे ,तब श्रीकृष्ण ने उन्हें यह व्रत करने को कहा था . संतान और धन की कामना से यह व्रत किया जाता है .